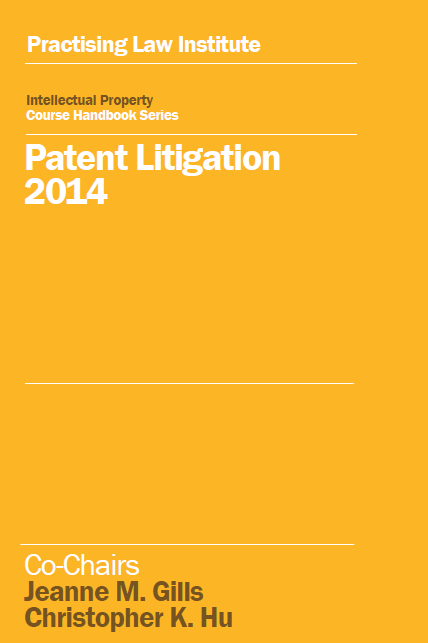 Chapter 4. Business Method Patents—Where Are We Now? Chapter 20. Turning Your Star Employee into Your Star Expert in a Patent Case: Is it Worth the Risk? Christopher speaks frequently at industry events on topics such as the interaction between the Leahy-Smith America Invents Act (“AIA”) and litigation, including patent litigation. Jeanne M. Gills is a Partner and Vice Chair of Foley’s national Intellectual Property Department and also sits on her firm’s Management Committee. She has previously served as the former Vice-Chair of Foley’s IP Litigation Practice. Over her career, she has tried and been lead counsel in numerous complex patent, trade secret, trademark, copyright, and unfair competition litigation and appeals—including PTAB post-grant proceedings—in diverse industries (from electronics to biotechnology). Her trial experience includes the TAS v. Cummins trial regarding a technology and trademark license agreement (over $150 MM at stake) and “bet the company” cases such as DeKalb v. Pioneer regarding patents on genetically engineered corn (over $500 MM at stake). Her litigation experience has dovetailed into counseling clients on global IP strategy, including work on the division of patent/technology assets for Kraft Foods’ 2012 split (into Kraft Foods and Mondelez) and leading the IP side of M&A transactions, such as recent $1.2 billion deal involving the creation on behalf of power technology companies two JV entities (one in the U.S. and one in Switzerland). She has been recognized among The Best Lawyers in America (Food & Beverage, 2015-2017; IP Litigation, 2017); Benchmark Litigation Local Litigation Star (2018) & Top 250 Women in Litigation (2017); IAM Patent 1000–The World’s Leading Patent Practitioners (2012-2017); Crain’s Most Influential Minority Lawyer List (2017); Managing IP’s Top 250 Women in IP (2013) & IP Stars (2013-17); Legal 500 US (Patent/Trade Secret Litigation, 2007, 2010; Patent Transactional, 2015-2016); Leading Lawyers (Patents, 2012-13, 2017), LawDragon 3000 for IP (2011); Illinois SuperLawyers® (2005, 2006, 2008-2018); “Top Minority IP Partner” by AIPLA & MCCA (2003); Nation’s Best Advocates: 40 Lawyers Under 40 by NBA & IMPACT (2010); and the “AV” rated attorneys through Martindale-Hubbell’s peer review process.